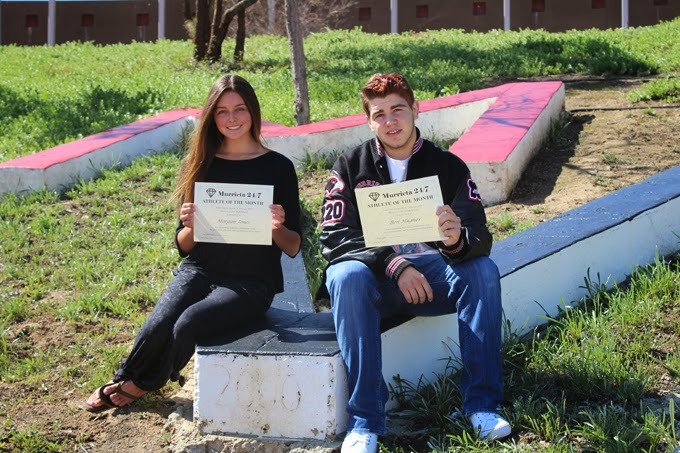 Wrestler Ben Hughes and water polo player Morgan Jones are the Murrieta 24/7 Athletes of the Month representing Murrieta Valley High School. Hughes took second place in the Southwestern League this season at 220 pounds. He placed fifth in the CIF finals -- winning his last match by one point in triple overtime -- to advance to the Masters meet. Unfortunately, a serious illness prevented him from competing there. "Ben really has a love for our sport and helps me by motivating, supporting and inspiring his teammates," said Manny Murillo, Hughes' wrestling coach. "Pins are very hard to do and he did it 24 times. He is also the only wrestler this year to make it to the Masters wrestling tournament." Hughes finished the season with a 30-8 record with 24 pins, two technical falls and three decisions. Although just a sophomore, Jones is the starting goalie for the Nighthawks girls water polo team. She helped lead the team all the way to the CIF semifinals this winter. MV finished the season with a 19-11 record. "The beginning of the season was a rough start," said Jones, who has played the sport since she was 6. "As we got to the end of the season, we all connected. We weren't really on our A game in the semifinals, unfortunately." Jones looks forward to the challenge of starting in goal for the next two seasons. "It's a lot of pressure," she said. "The team depends on you to pick them up if they're down. But I really enjoy it." Jones has also competed for the cadet national team in the Olympic Development Program. Each athlete received a certificate from Murrieta 24/7 and two tickets to Rock Fitness gym from the award's sponsor, Sun Pro Solar.